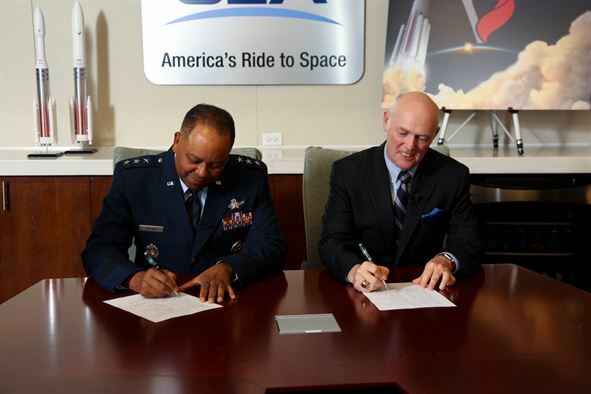 September 27, 2016 – The Space and Missile Systems Center signed a Cooperative Research and Development Agreement (CRADA) with United Launch Alliance (ULA) as part of the company’s effort to certify its new Vulcan launch vehicle for National Security Space (NSS) missions. This cooperative, jointly-written agreement facilitates data exchanges and protects proprietary and export-controlled data. The CRADA will be in effect until all non-recurring design validation activities for Vulcan are complete. This CRADA enables the Air Force to evaluate the Vulcan launch system according to the Air Force’s New Entrant Certification Guide (NECG), and contains a detailed Certification Plan that specifies all of the non-recurring activities. As part of the evaluation, SMC and ULA will look at flight history, vehicle design, reliability, process maturity, safety systems, manufacturing and operations, systems engineering, risk management and launch facilities. SMC will monitor at least two certification flights to meet the flight history requirements outlined in the NECG. ULA will give the US Government specific levels of insight into the design and testing of the vehicle during its development; the breadth and depth of this insight allows for the number of certification flights to be two. Once portions of the non-recurring validation are complete, the SMC commander may make a determination to grant certification. This approach is consistent with other CRADAs. In addition to the Vulcan CRADA, SMC anticipates entering into additional CRADAs with SpaceX for their Falcon Heavy rocket and with Orbital-ATK for their Next Generation Launcher. Currently, ULA’s Delta IV and Atlas V, and SpaceX’s Falcon 9 Upgrade are the only certified launch vehicles for sending NSS payloads into orbit. Having multiple certified launch vehicle providers and multiple families of launch systems bolsters U.S. assured access to space. The Space and Missile Systems Center, located at Los Angeles Air Force Base, California, is the U.S. Air Force’s center for acquiring and developing military space systems. Its portfolio includes the Global Positioning System, military satellite communications, defense meteorological satellites, space launch and range systems, satellite control networks, space based infrared systems and space situational awareness capabilities.